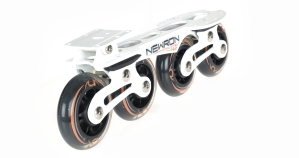 Here is the NEWRON double tandem platinum that offers a unique, patented technology . Whether for the hockey player , speed skater or simply for fun to skate , this highly durable aluminum frame provides more fluidity and power. These features will be appreciated by the consumer. Adapting to almost all surfaces, the skater will experience a bigger feeling of security when practicing his favorite sport because the platinum offers more stability.